This does give you a free webpage containing their domain name in part, limited bandwith space, basic templates and design and Wix ads. In essence they want you to sign up to their paid plan, as that’s how they can afford to place ads at peak time on mainstream and all over You Tube ads with Karlie Kloss! There’s HubPages which gives you a platform for building niche articles. There’s also Weebly, Yola and FreeWebs to consider, bit for me, the simplest and most effective way in which to create a straightforward landing page is Google Sites. The one thing you do need if you don’t already have on is a free Gmail account. What I would advise you to do is open up a separate account for this, as you can take note all of your landing pages and in case you run in to any problems with Google. Once you have your new Gmail account sorted you then want to log in to Google Sites and get in to the “meat and potatoes” and kick-start your first landing page 🙂 On the left hand side of the page click Create and from the drop-down menu select “In New Sites” and you should get an opening like the screen-shot below? 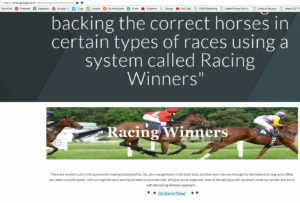 From there I’m going to give you an example one on of my horse racing websites called “Racing Winners”. The first thing I want to do is have the headline in the “Your Title Page” section. 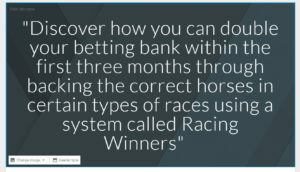 I’m going to use the bold statement from the top of my website which reads “”Discover how you can double your betting bank within the first three months through backing the correct horses in certain types of races using a system called Racing Winners”. As you can see from the above screenshot I now have my headline in the box (use the arrows to stretch the page out from side to side) and the next part is to place the header of the site just below the headline. 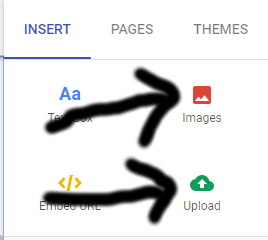 You’d get that by selecting “Images” or “Upload” from the right hand side of the page. I now have my headline and banner in place, the last piece of the landing page jigsaw is the final message and call to action containing your link. Click the “Text Box” on the top right hand corner of the screen and the following message I want to place is “There are no shortcuts in this business for making decent profits. Yes, you may get lucky in the short term, but that won’t see you through for the medium to long term. 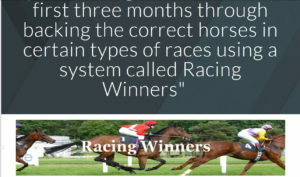 What you need is a solid system, with a straightforward and logical selection process that, will give you an edge over most of the betting public and that’s what my number one aim is with the Racing Winners approach. Get Started Today!”. The screenshot above is a bit blurry, but I’ve got the text that I wanted at the bottom of the page with the call to action message of “Get Started Today!“. In order to place your link in a specific area and make it clickable you have to hover over the area in question, click the chain link above and place the URL address in the relevant line. You can also do this with an image using the same approach. Once you have everything in place that’s it, you’re basically ready to publish the page which is the box at the top of the page appropriately called “Publish”. Once you’ve done that you want to call the name of the page something relevant to what it is you’re promoting. 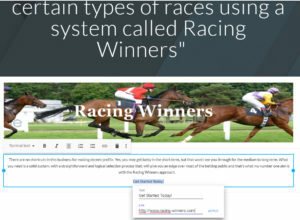 In this instance I’m calling it Racing Winners and then the final publish. The final page looks like the screenshot below. 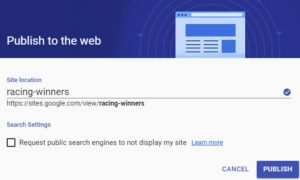 The URL address of the page is https://sites.google.com/view/racing-winners/home and that’s what you would promote to people. 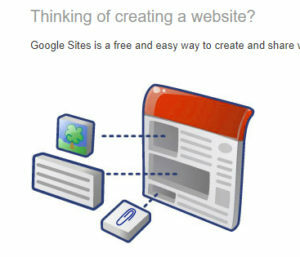 This entry was posted in Services and tagged free, google, landing, page, sites by MDB Marketing. Bookmark the permalink.